Write informative/explanatory texts to examine a topic and convey ideas and information clearly. 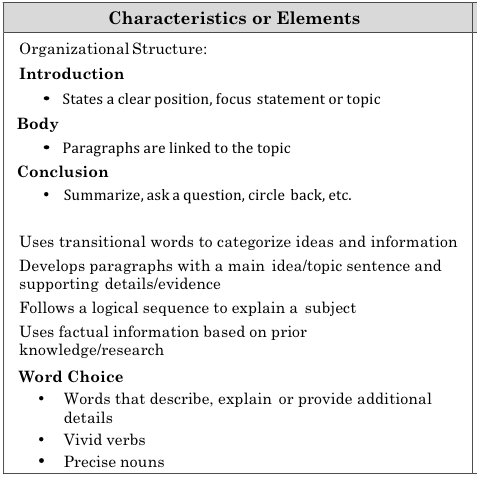 Introduce a topic clearly and group related information in paragraphs. Link ideas within categories of information using words and phrases (e.g., another, for example, also, because). Use precise language and domain-specific vocabulary to inform about or explain the topic. Provide a concluding statement or section related to the information or explanation presented. The Reed Union School District is committed to providing accessibility for all. If you experience difficulty with the accessibility of any web page or documents on our site, please contact us to request this information in an alternative format.